The Xbox brand lacked a single destination to make it simple for the media, fans, and general consumers to get the latest Xbox news straight from the source. To drive stories we wanted people to read, we needed a premier platform to communicate with these audiences. 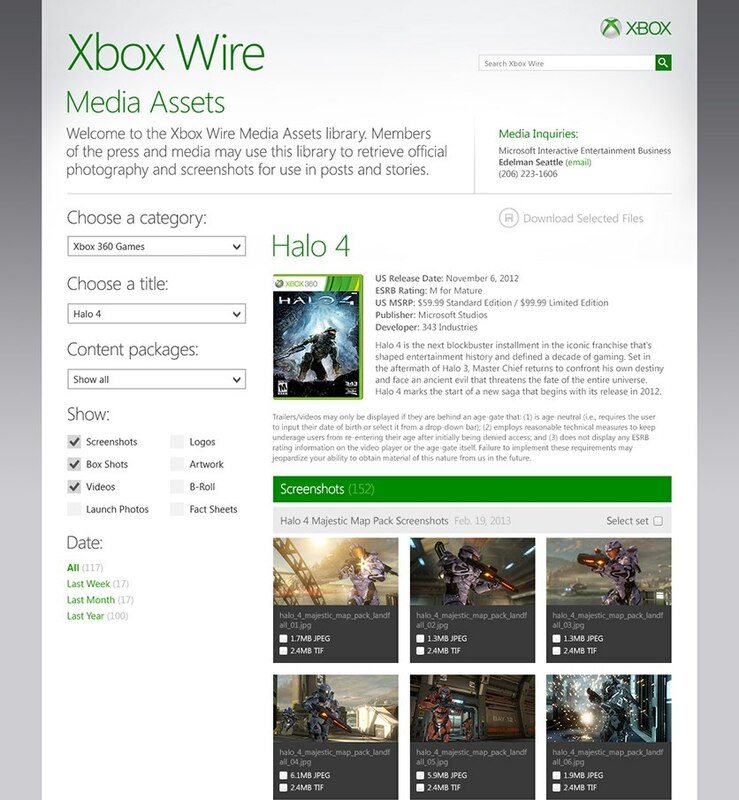 In addition, this resource would launch alongside the new Xbox One console, becoming Microsoft's front line for distributing news and announcements. 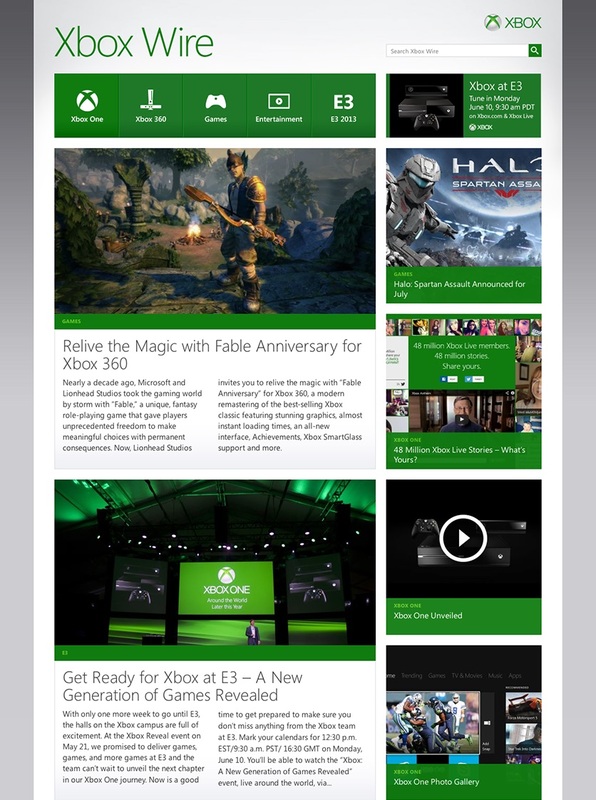 Xbox Wire was designed as a visually rich, on-brand storytelling platform. The design was built upon Microsoft’s corporate-wide Modern UI motif, featuring a modular grid for content presentation. Categories at the top of the site allow visitors to filter story topics relevant to them, while content “Tiles” accommodate images, videos, slideshows, and more. As a site with media as a primary audience, we developed a robust Media Assets library to transparently deliver high-quality assets to users. Bloggers and members of the press can easily search or drill down to specific categories of content, and download individual or packaged assets for use in their own topic coverage. 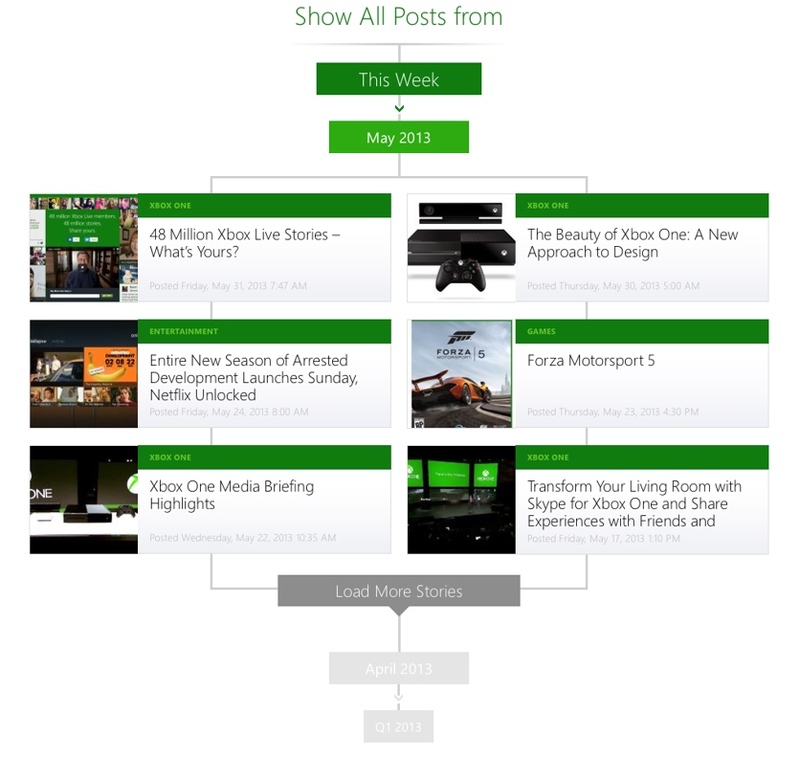 Eschewing a traditional calendar-style site archive and embracing Xbox’s new image-centric brand theme, we developed a “visual archive” system for finding previously-posted content. Designed in an expanding/collapsing accordion style, this timeline-driven approach makes finding and exploring older content a pleasure. Given a dramatically large mobile audience, we created a display adapted especially for mobile devices, featuring Retina-quality imagery and a simplified, stacked content presentation. Videos play in-line, while users can quickly swipe through our rich collection of posts and stories on the go. 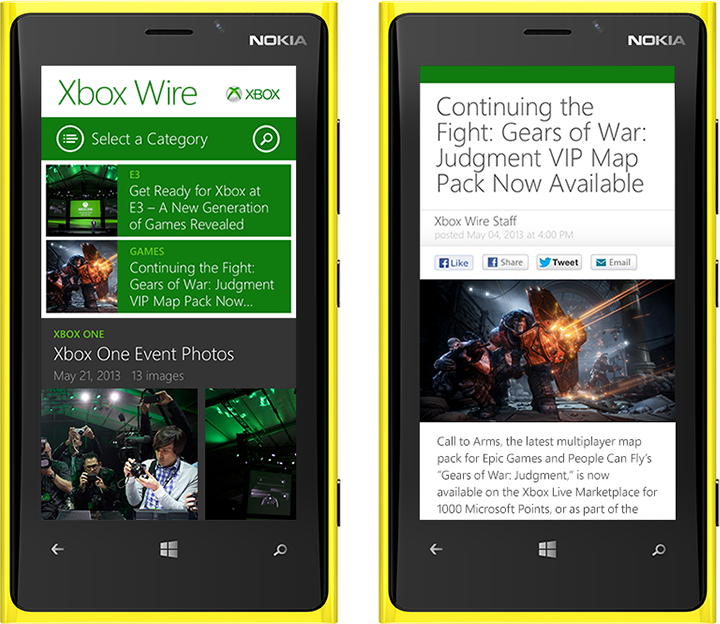 Since launching May 16, 2013, Xbox Wire has seen 5.6MM visitors and nearly 8.5MM page views. Prior to launching, clients were hoping to generate 500,000 page views between launch and the end of the fiscal year, June 30, 2013. In reality, the site saw more than 4.2MM page views in that six-week timeframe, blowing projections out of the water.